Joe knows Ireland love him but knows he can't stay here forever. 2023 seems to be long enough for him to see his vision through but could also destroy his legacy. I think the wife and kids will be the ones to decide. I think the wife and kids are central to the eventual choice...but really, I don't think any of us that don't already know his decision are any closer to sensing his decision. He's playing his cards very close to his chest and is a damn fine double speaker. I'm usually pretty good at reading the signs and signals in the language people use.... but he's frustrating the hell out of me and virtually everything he says could be interpreted as 'I'm staying' or 'I'm leaving'. I don't personally think he'd walk into the main ABs job - I don't think he believes he'd walk into the job. (Maybe he will - laws and traditions are made to be broken) But ultimately, he's 53. Does he really need an assistant role for four or five more years? Leinster players had a big hand in coaxing him to become a head coach with them (Sexton being particularly influential). Then we quickly gave him his first International head coach job - no Assistant level apprenticeship, just straight in, because we saw that he had the talent to excel in the role. He, and the players around him, have proven that they can handle the very top of the tree. So staying here wouldn't limit his horizons - in theory. But it seems he's hinting that he's hit a crossroads of sorts and perhaps that is family influenced - parents back home perhaps. Even so, I even have difficulty with those prospective reasons. Plenty of people go abroad to live and never go home permanently. It seems in sport though, the idea of going back home is always more romantic a concept than it is for the vast bulk of emigrants who just accept that another life and commitments exist. So I don't know what's in his head really. Moving back home at this stage in his life seems to me to be only the beginning of another era of stress for him (new family arrangements, new job). So maybe the crossroads is his decision to kill off the niggling dream of being ABs coach and live with the reality of his present. I hope it's the latter and will be very sad if he decides to go - but will of course respect it. When I saw that it was a nice bit of 'intrigue' before the game. "What the hell was that? Why did Hansen do that so publically? Whatever it was, couldn't it be given to him in the tunnel?" All those thoughts. Money for tickets...................... hmmm. You never know. Maybe a message from Putin that he wanted to give to Hansen to give to Joe to give to the USA coach this week to give to Trump! It's f**kin' World War 3! That's what it is! No wonder the ABs didn't care about losing - next year won't even happen. The width of the paper roll in Joe’s hand seems a bit too wide to be cash doesn’t it SecretFly? How wide are the notes over there? ebop wrote: The width of the paper roll in Joe’s hand seems a bit too wide to be cash doesn’t it SecretFly? How wide are the notes over there? The stare from Hansen seems pretty serious and the delight on Joe’s face is more than what you’d expect from just receiving a couple hundred bucks. Nah... you're right, ebop - it was his Orders okay. "You will depart Emerald Isle at precisely 9.00pm Sunday. You will be given further instructions when you land in Oz. The Wicked Witch of the West will give you your AB kit on departure for New Zealand. Do not disappoint us with non-compliance. We will look for you, We will find you. We will kill you. This message will self destruct in 10 seconds. " Thus why Joe ran off the park after getting it. "Sorry about the horse's head in the bed, Joe. Hope the wife wasn't too upset. But I gotta let you know how serious I am when I tell ya your not gettin' me bloody job. Not today, not tommorah, no ever - dipschidt!" I assume you guys want to retain Schmidt? “In order to get the NZ public to accept you straight back into the AB Mob we need to let you and Ireland beat us again to build your aura up further. It will be painful but this must happen but for this game only and if we meet in the RWC we will destroy your team....best wishes, Steve”. I couldn't speak for everyone, Bilt. Some think we have good replacements ready. Farrell has been mentioned to take on Head Coach role. Or he could link up again with Lancaster (currently at Leinster) - they might think they have unfinished business as a coaching unit. So some supporters would feel that we're okay to keep the standards up if Joe went. But personally, I like everything about Joe. Not just his coaching, his personality. I like it that he came to Leinster first and gave us some very happy years.... then loved it that he stuck around and went over to Ireland International. So it's a long affair, as it were and there'd obviously be sad feelings of 'end-of-era if he goes. His coaching role has been proven with us but I just like having him around too. I like his quiet gentle modesty added to his ruthless attention to detail. How long has he been in Ireland? Biltong wrote: How long has he been in Ireland? He said to Sexton at the time that he was afraid the Leisnter players wouldn't listen sufficiently to his methods and instructions. Sexton said "You just teach us... we'll take care of the other players" That impressed him. And he's been impressing us since. Surely Gatland is the next NZ coach? I like rebels though. Gotta have a George somewhere to keep everyone else on their toes. I like George. He wasn't always wrong. Anyway. Game worked out like expected. Tough slog first half, opened up in the second. Whilst America were asking questions in that first half, I do think that we overdo the breaking down phase. Don't mind that process if it looks clinical but today it looked to be very disjointed. A lorrah errors. Some players didn't seem to know whether they were in breakdown phase or open-up phase. Beirne seemed to be overplaying everything. It's 15 men Beirne. Let the others play their bit. Henderson did some good stuff but he's still looking overall subdued. Wish he regained more of his bloodymindedness. Result was pleasing with mostly second string guys but the first half was messy as hell. Schmidt spoke to journalists after and said the IRFU had been very patient with his decision. He said they said, don’t be rash, if you change your mind, then we’d love to continue that conversation. If you change your mind another way, then we could discuss that too. I wonder if Joe wants to have a tilt at the Lions and do a transition to NZ after 2021. Or maybe he’s just going. Feck! The Lions could just be one of the things that he might agree to stay for. Winning a Lions series is about as close as it gets to winning with the ABs. Its easily the biggest thing outside AB rugby in terms of a tournament or series, from a NZ perspective. And if the trend is towads a NH dominance, why bother leaving at all? Plus, the pay is better. When Joe makes his announcement do the Irish people on here think it’ll negatively impact their chances at next year’s RWC? It’s common for people that have one foot out the door to underperform because they’ve subconsciously checked out. Glad you enjoy the Lions, Taylor. I think maybe you guys in the SH should take on the mantle now for a decade or 10. The Southern Lions. - Nice ring to it. We in Ireland could just get on then with trying to keep improving as a Nation. ebop wrote: When Joe makes his announcement do the Irish people on here think it’ll negatively impact their chances at next year’s RWC? It’s common for people that have one foot out the door to underperform because they’ve subconsciously checked out. Well let's not forget the on-field note, ebop. If Joe is going, then it's probably a very meticulously planned exit - ie, it'll have a lot to do with what's going down in New Zealand as regards Steve. So what will that mean for Steve's impending announcement? If Joe is going, then it might be a good thing to bet that Hansen will give an end date for his tenure with the ABs too. So .................... adding one and one.................. both sides underperforming come WC? It's a Scotland WC so. Schmidt now has to be the prime candidate for the ABs even though Gatland would like to think its his. NZRFU doesnt. I dont think Schmidt would pass up the ABs commencing 2020 even with an offer of the Lions in 2021. And I cant see NZRFU allowing him to do it - the WRU ought never to have allowed Gatland to do 3 tours in his tenure and I think Wales could have achieved so much more had they not. Pie wrote: Schmidt now has to be the prime candidate for the ABs even though Gatland would like to think its his. NZRFU doesnt. A good few Welsh supporters probably feel their role in those Lions tours (players plus coaches) compensated for the National side being sidetracked. But I'd be with you, Wales should have come first, second and third, and if Schmidt stuck around in Ireland, I'd hope that it wouldn't be for the carrot of Lions. That's not the right kind of 'staying' in my eyes. Ireland have a lot of selfish work to do over the next number of years. ABs look after themselves - all other Nations should follow the habit. Schmidt is gone. If not then he's a great actor! I don't think the coaching team will change much. We'll need a new attack coach. Jones and Gatland are already set to leave before the next World Cup. Jones was originally due to leave straight after, until the RFU negotiated a transition period. If we have a bad tournament he could yet go sooner. I don't think teams are derailed knowing the coach is going. There's sufficient common purpose to try and get a job done. I suspect there will be disappointment if Joe decides to go but that will wear off. Interesting Lions tours are said not to be popular when they are by far... far, the biggest supported rugby tour overseas by fans, ofvany country/ies anywhere. Taylorman wrote: Interesting Lions tours are said not to be popular when they are by far... far, the biggest supported rugby tour overseas by fans, ofvany country/ies anywhere. No-one denies they Lions tours draw a crowd and rake in revenue. What some supporters are asking more often now, is how they benefit their national side, and the answer is that they don't. I enjoy Lions tours but, unless the global calendar is radically changed to accomodate them, then they will contine to be disruptive, which will only increase the disatisfaction. I think it because it smacks of old school tours and I expect Home Nations fans have the most cash to splash on these jaunts....I've been on two 09 and 13 and they were superb. Fans were everywhere here in Wellington during last years tour. Great bunch. Very popular to talk to wherever they went, especially in pubs when you had the 50’s and 60’s lot all reminiscing about the tours in the 60s etc. After five minutes youd think two strangers were lifetime mates talking about a match they both went to forty years ago. When they come in big numbers like that kiwis love getting out and just talking rugby. Well, so it's official. Joe is going home after 2019. I'll say my goodbyes then so. A lot of work to get done before then. We're been greedy and I wish him well in his year or two out of the game. Mind you, it might only prove to be a month or two out He'll obviously have carrots placed before him. But for now............ on we go with the Joe show. Shame for ireland but very understandable as family needs to come 1st. Good opportunity for farrell too. No 7&1/2 wrote: Shame for ireland but very understandable as family needs to come 1st. Good opportunity for farrell too. Could be very interesting with Farrell. First thing Farrell will need is a coach to replace Joe. (Joe being a coaching coach rather than a Director coach). Hmmm....who we got that might interest him? That would be newsworthy. The boss and the assistant turn things around in another Nation. And if the two of them could keep things motoring for Ireland then it'd be hopping and skipping back to England eventually for another, more mature shot at coaching their home Nation. I was wondering whether Lancaster replicating his Leinster role could work. Would be amusing if it happened and if it worked. It's risky Tiger but it has potent potential. The risk is that Lancaster would seek to just transfer Leinster style over to Ireland - and perhaps the surest sign of how smart Joe Schmidt was as a coach was that transition from Provincial coach to International. Everyone expected him to bring his Leinster sensibilities to Ireland and were ready for fireworks...but....................... it was ruthlessly boring stuff he brought. And he built and built slowly on that ruthlessly boring framework - adding bits all the time but in no hurry to become a fireworks team. So, I think Farrell and possibly Lancaster could be a forceful unit together again but it would need to understand that it's not always about dashing and ducking and sidestepping and offloading. You have to have all players willing and able to indulge in the dirty stuff at the breakdown and tireless defending. It needs a strong balance and so the attack philosophy has to be mellowed through 80 minutes. Lancaster seems attack driven (which is a good thing) That new balance where he's the assistant though to the defensive expert.... it might be a nice combination; IF Lancaster came in, that is. He might though go straight back to England or somewhere else. So as expected Joe is gone after the RWC. He is genuinely irreplaceable, a genius. I think he not just the best coach in rugby but possibly any sport and we'll never see the likes of him again. At both Leinster and Ireland he's had good players to work with but there's no doubt for me he was fundamental their successes and making them much more than the sum of their parts. I'm sure he will be like a man possessed over the next 11 months to go out on a high. Farrell is the obvious replacement. He's certainly added something since he came in and will continue to drive standards forward, so although I'm very sad to see Joe leave we are lucky to have such a quality replacement already in place. Anyway, if Joe was there, the two of them (Sexton and Joe) must have looked at each other a few times and wondered where all the time had gone since their first meeting. It's passed in an instant. All good things come to an end, I'm just glad to have lived at a time to witness Ireland evolve from 5N wooden spooners to a genuine world force. That certainly didn't begin with Joe but he has certainly taken things to another level. I think there will be a drop off from Ireland, long time to go until the RWC in rugby terms, I can see this knocking 5-8pts off their performances. rodders wrote: All good things come to an end, I'm just glad to have lived at a time to witness Ireland evolve from 5N wooden spooners to a genuine world force. 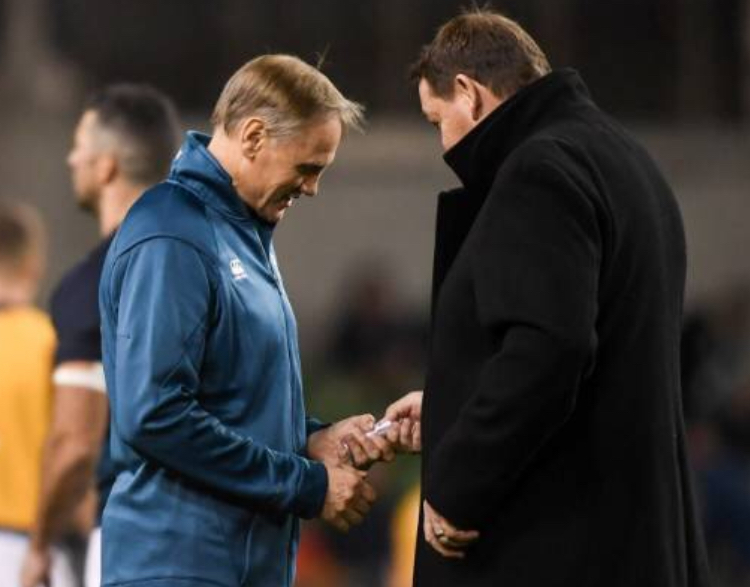 That's exactly how I feel about it Rodders, it's been a privilege but this time next year it'll be time to move on to a new era for Irish rugby. We can't replace Joe, there's nobody out there that can. TightHEAD wrote: I think there will be a drop off from Ireland, long time to go until the RWC in rugby terms, I can see this knocking 5-8pts off their performances. That'll be okay then. Coz when Stevie Hansen tells the ABs that he too is going after 2019... that'll drop 5-8pts off their performances. Who do we speak to about getting Joe an OBE for services to rugby in Northern Ireland? This just in from Nucifora: *evil chuckle* That's one interfering bollix gone. Now onto that other c**t, Browne. When he's gone I shall declare myself Infallible and a God. I shall then ruin Ulster with more glee than I could muster whilst being curtailed"
Damn. You Ulster lads were right about him all along! Dark times ahead. I agree. Amazing man. I can see Ireland going back to a 2nd/3rd place team for a long time now. Is it true he is quitting rugby altogether or just for the moment? Is he staying in Ireland or going back to NZ?